Over the past week, the overwhelming majority of EVE Online’s player run coalitions have begun to band together and field some of the most powerful fleets that the game has ever seen. The game’s galaxy map is split along its North-South axis, with each side attempting to drive a vanguard strike deep into the heart of their enemies territory. In short, it’s looking like war—maybe the biggest one yet, which is saying something. From the Northeastern side, the Pandemic Legion alliance along with their allies have deployed their super-capital fleet aggressively against their enemies, the Legacy coalition. In response to this the Imperium, the group I am a part of, has joined forces with Legacy, and counter-deployed a significant portion of their own super-capital forces to the north, to threaten Guardians of the Galaxy, allies of Pandemic Legion. The politics of this war go very deep and can get confusing very quickly. A good real-world analogy would be that the game’s tangled web of alliances are going through turmoil similar to what led to the start of the first World War. Chains of allegiances, old rivalries, opportunistic upstarts, and some players who just live to see conflict are being drawn slowly together to support one of the two sides. Already in this war there have been three fights over the largest player-built structures, Keepstars. These massive space stations, each reminiscent of the Death Star, are the only place that the largest ships in the game can safely dock. This makes them amazingly valuable as strategic beachheads or as defensive choke points. In the North, the Imperium and their allies brought a reported 400-plus Titan-class ships supported by hundreds of super carriers and several hundred more smaller vessels to lay siege to a keepstar owned by the Circle-of-Two alliance. Northeastern forces managed to prevent the Imperium from properly bringing their amassed firepower to bear against the already damaged space station by blockading the system and using a structure that disables any independent jump drive on a ship. This prevented super capital vessels from teleporting themselves into the system and enabled them to bypass the blockades. Imperium forces were forced to retreat from the field after suffering minor losses of subcapital ships, but have vowed to try to assault the Keepstar again in the coming days. On the opposite side of the map, that same day, a Keepstar belonging to the Legacy coalition was destroyed by Northeastern forces. Over 2000 ships were seen in the system firing on the structure, with only around 300 vessels showing up to provide defense. The battlestation buckled relatively quickly under the amassed Northeastern firepower, the battle lasting little more than an hour in duration. Players from the Legacy coalition have made claims on Reddit that the station was acquired cheaply, and was located outside of their primary defensive area. This mitigates the loss of the structure at least slightly, and it is likely not a major strategic blow to their overall war effort. Most recently, this conflict erupted into an all-out brawl lasting for approximately 10 hours of real time, which led to the destruction of multiple supercapital vessels and yet another Keepstar-class battlestation. The Legacy alliance attempted to secure the system of UALX-3 by erecting a Keepstar to serve as a beachhead. Automated construction of these massive stations requires a 24-hour timer, at the end of which the station must generate its protective shielding over the span of 15 minutes. During this window, if attackers can cause enough damage the space station’s repair cycle can be paused, and given enough firepower it can be completely overwhelmed and destroyed by enemy forces if it is not successfully defended. As the repair cycle for the UALX-3 Keepstar approached, Northeastern forces mounted an all-out assault, fielding massive fleets complemented by a large amount of Titan-class vessels. Titans are EVE’s largest spaceships, which take approximately a month to construct, and are often valued at over $1,000 each. Once the ill-fated repair timer of the battlestation began, the arrayed Northeastern forces were able to apply enough damage to interrupt the cycle, and began the long process of destroying the station. Once they seemed satisfied with their position on the field, Northeastern Titans began to arrive onto the battlefield. In response to the Northeastern titans, the combined forces of the South began calling in their own supercapital force. The two fleets clashed for hours, eventually witnessing the destruction of the Keepstar that began the battle. Alongside the Keepstar, dozens of super-capital vessels as well as hundreds if not thousands of smaller ships were destroyed during the conflict—which was interrupted when the server infrastructure supporting the nearly 5,000-player duel buckled and crashed. The server crash seemed to occur because of the arrival of an Imperium reinforcement fleet of Titans, which had deployed from the northern front of the war. After completing a several-hour journey across nearly the entire breadth of the EVE universe, Imperium vessels began jumping into the battle, when, by reports, the game began to lock up and act erratically. CCP Falcon, one of EVE’s community managers, posted updates on the server’s status while CCP worked to restore connectivity. Once the game servers came back online, some of the engaged players logged back into the game, resulting in at least one additional titan kill, before the game’s scheduled daily down time brought the servers offline again, ending the battle. Early reports suggest 10 titans lots from the Northeastern forces, with Legacy losing 4 of their own. 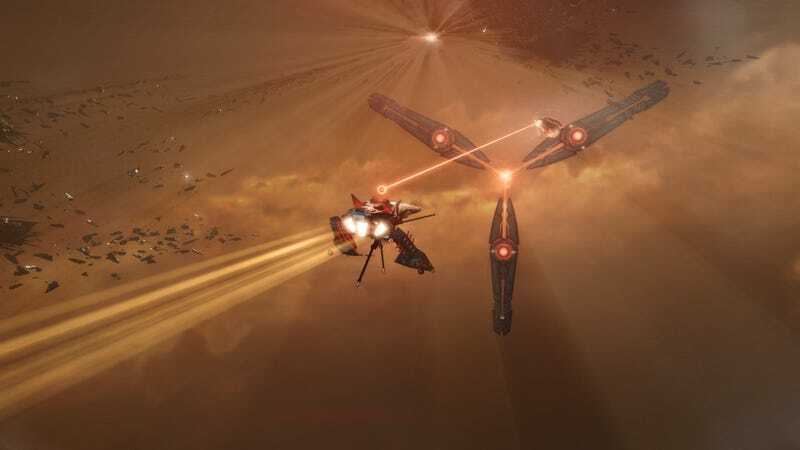 However, at the time this article was written, reports from this battle are still incomplete, and the full tally of destroyed vessels is still unknown. . What is known, is that the Keepstar that began the fight was destroyed, and both sides will likely be scrambling to replace ships lost during this brawl. This war has only just begun, and players on both sides have been at a relatively tense peace for quite some time. This restlessness caused by prolonged peace, plus the bitter feelings held between members of the two factions, holds potential for this conflict to escalate into one of the largest wars in EVE’s 15-year history. Nothing is set in stone, however. At any moment, a diplomatic deal or a well-planted spy could bring everything to a screeching halt. Kotaku will continue to cover major moves of this war in the coming weeks as it develops.